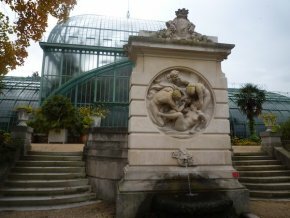 28/1/11 – Heritage – Paris, Serres d’Auteuil – On last 20 January, the Commission du Vieux Paris visited the Serres d’Auteuil to see for itself the impact of the extension project for Roland-Garros on the garden (see our articles). The President of this advisory committe, Danièle Pourtaud, deputy assistant to the mayor of Paris for heritage, was present. Quite logically, the commission members expected this controversial subject to be on the agenda for the meeting which was to be held on 27 January. Having noticed this was not the case, several of them emailed requests for the matter to be added, but to no avail. Naturally, we wonder why there is an advisory committee if no one takes its advice. Someone even asked if the Fédération Française de Tennis could receive the Commission’s advice without providing an answer to the question. The only result was a promise to consult the Commission if the FFT decided to remain in Paris and extend Roland-Garros into this garden which is protected as part of the country’s historical monuments. Having thus realized that they would in fact be witnesses to a fait accompli, nine members of the Commission decided to leave the room, an incident which, to our knowledge, has never before happened in the annals of this institution, which is over a hundred years old. This strong reaction by some of the members of the Commission du Vieux Paris is just the latest incident marking the very firm opposition to the affair which, much like in the case of the Hôtel de la Marine, proves that public opinion has become increasingly aware and concerned by this threat of vandalism. Notably, on 19 January the G8, that is the group of eight large national associations for protection of heritage, wrote a letter to the president of the FFT to denounce the Parisian project. And on 25 January in Le Monde (dated 26 January), Françoise Hardy, who was obviously not convinced by Bertrand Delanoë’s response which was full of half-truths (see article in French) to her letter a few weeks earlier, signed an open letter addressed to the ministers of Environment, sports and culture alongside the members of the Comité de soutien des Serres d’Auteil.